Here is your Angel Card Reading & Channeled Message for the week of November 6. As always, I asked the angels to please bring me a clean and clear message for you, my clients, students, and followers. For today’s reading they took me to the Energy Wisdom Oracle Cards by Dina Kennedy (yes, the deck I channeled! ), and as I shuffled one card flew out for you. 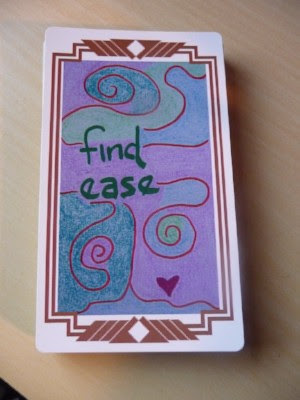 The message for this week is FIND EASE. When this card appears, the angels are saying it’s time to chill out, time to take a breather, time to let some of the burdens weighing you down GO, even if just for a little while. Find Ease comes when we’re running too fast, juggling too much, and not remembering to pause, to breathe, to relax and release the energy. Where could you lighten up a little this week? What could you ease up on? How could you make some space for breathing and just being? Roll these questions around in your mind, dear one, and whatever idea comes up is the one to start with. I’m intrigued that the angels are offering you two interpretations of today’s message of FIND EASE. One is to lighten up around a specific issue, the second is to add some activities which create ease into your week, with focused intention of easing in both. Ease and flow. Relax and flow. Lighten your burden and flow. Peace. And with that we are complete, You are so loved. If you need help with this week’s message assignments, please call on the angels to show you the way, and they will!